Fretting fatigue can occur when two surfaces are clamped together under a normal load with a small relative motion of the surfaces. Fretting fatigue can reduce surface strength from one-half to one-third of the normal endurance limit. What types of parts a commonly subjected to fretting damage? Fretting fatigue is a damage mechanism from the formation of oxide debris by corrosion with a reduction in fatigue strength. Fretting damage is often classified with corrosion processes in literature because of this oxidation. The debris is created as oxide layers are repeatedly formed and removed by the abrasive action of one surface sliding against the other. 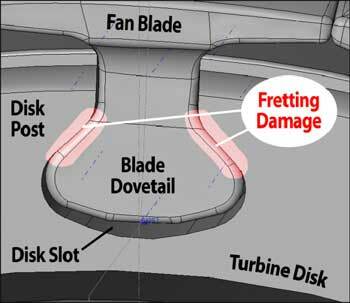 The fatigue debit from fretting is not caused by the visible corrosion, but by small shear stress initiated by fatigue cracks at the edges of the contact zones. If two blocks are clamped together under a normal force, so that they partially overlap to form a contact zone, and then cyclically loaded placing the contact zone in shear, the maximum shear stress will occur at each end of the contact zone. This “edge of contact” is the initial location of fretting fatigue. The fretting shear stress distribution is quite shallow, typically extending less than .005 inches into the surface with maximum shear stress magnitude at the edge of contact. Shear cracks will initiate at nominally one third of the life anticipated without fretting, and grow in shear (Mode 2) to the shallow limit of the alternating shear stress, only a few thousandths of an inch. 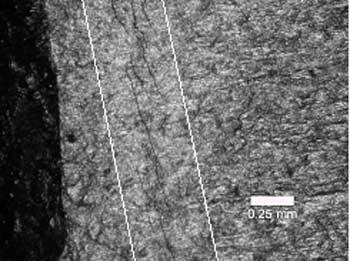 Fatigue failure results from the cracks then propagating under the applied normal stresses (Mode 1) on through the component. 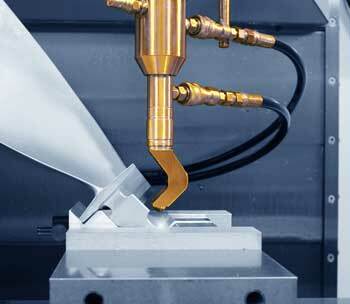 Because shear and normal stresses are inherently orthogonal, it is not possible to stop the formation of fretting damage from shear-induced micro-cracks by surface enhancement. However, the deep compression produced by LPB®holds the micro-cracked tips in high compression preventing propagation. The cracks simply cannot grow beyond the shallow fretting shear stress layer. LPB® has been demonstrated to completely mitigate damage from fretting fatigue for structural aluminum alloys such as 7075-T6 (both aluminum-on-steel and aluminum-on-aluminum), for 4340 steel, and for titanium alloys including Ti-6Al-4V. With LPB® applied prior to fretting, or even as a post-treatment and repair after initial fretting, fatigue failures cannot occur from the surface or the fretting induced micro-cracks. The fatigue strength achieved with LPB® is that of the subsurface material, essentially the vacuum fatigue strength of the alloy with no surface failures. 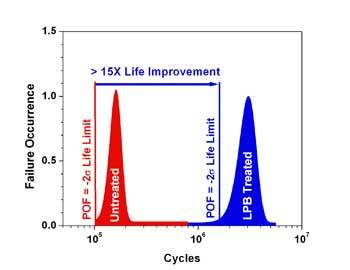 Lambda Technologies can answer any questions you have about how LPB® can mitigate fretting fatigue in cost-effective ways. For more information you can contact us by phone at (800) 883-0851 or by email here.